It’s Friday. Let’s play a game. 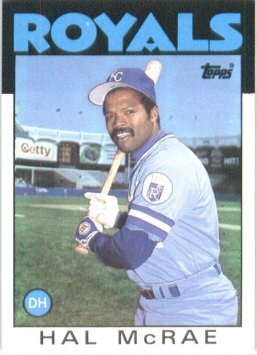 When I was a little kid – maybe 2 or 3 years old – my parents got me a stack of my first baseball cards. The cards probably weren’t anything spectacular and I probably bent them and put stickers on them and such. I couldn’t read yet, but they tell me that I was able to tell them whose picture was on each card. I’d memorized the names or something. Or I recognized them from seeing them play on TV. Or my dad had told me stories about his favorites and I’d remembered them. My parents would lay them all out on the floor and say, “I Spy…Jack Clark!” and I’d quickly point out which one I thought Jack Clark was for them. Good parenting, really. I was obviously raised well. Anyway. 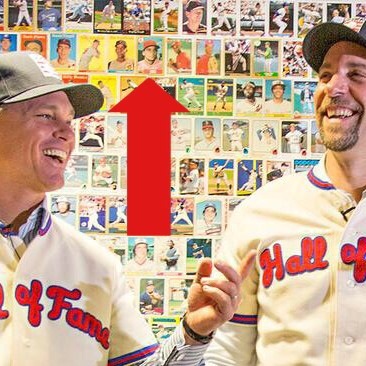 Yesterday, I had some fun playing the same game with the picture above tweeted out by the Baseball Hall of Fame – @BaseballHall. 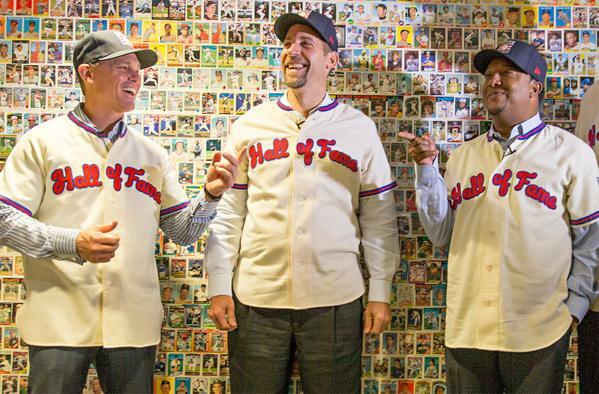 The wallpaper behind Craig Biggio, John Smoltz and Pedro Martinez is at the MLB Network’s studios in New Jersey. Those cards from my childhood would’ve been from around 1986-1990, which are the majority of the cards on the wallpaper here. 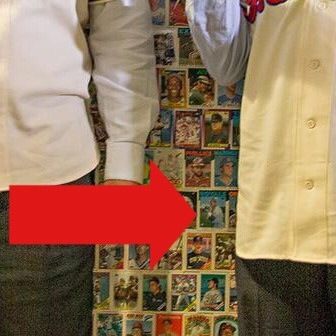 It’s tough to make many of them out, but my eyes immediately found the 1987 Topps Mike Laga card just above Biggio’s Tom Brady Face. 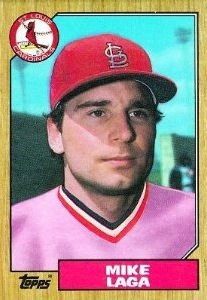 The pink jersey really gave him away. 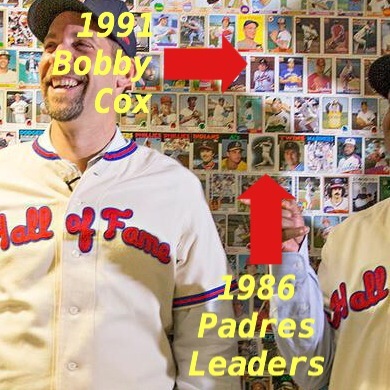 Next, I noticed the 1986 Topps Hal McRae down low between Smoltz and Pedro.
.@adampaulcooper @VFTSB I see the "Padres Leaders" card from '86 Topps (feat. Terry Kennedy). Just above Pedro's finger. 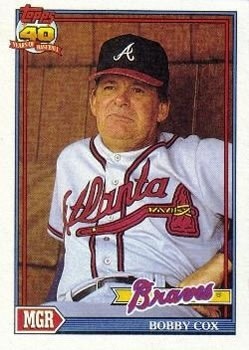 @adampaulcooper @VFTSB I see a '91 Topps Bobby Cox 3 rows above Pedro's finger. Anybody else spy any recognizable cards in that pic? Give it a look and see what you can come up with. In related news, I’m now toying with the idea of creating my own wallpaper somewhere in my home. Or maybe it’s for sale as a legit wallpaper somewhere. I’ll have to look into it. Happy Friday everyone. Enjoy the weekend. 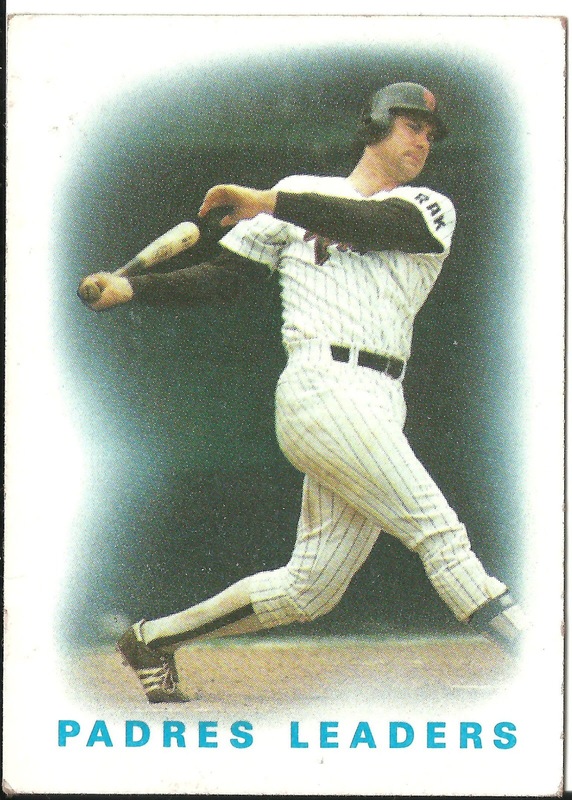 To the left of the Padres Leaders card is a 1986 Topps Mike Gallego. Next Next post: Shuffle Lessons, Volume 3.